Child food insecurity is a major issue in the Lower Mainland, but Bites for Kids, a KPU-based startup and social enterprise, is tackling the issue one food kit at a time. Bites for Kids was founded in January, when students in KPU’s BBA Entrepreneurial Leadership program began work on their practicum. Co-founder Braedon Campbell says that they decided to make Bites for Kids because they learned that 135,000 children in B.C. face food insecurity. On Feb. 15, Bites for Kids delivered their first food kits to children at three inner-city schools in Central Surrey. Their deliveries typically take place on Fridays so that children and their families are able to have food over the weekend. Campbell says that the startup received an overwhelming response from the schools they contacted. Unfortunately, because they are unable to supply enough food-kits to everyone who has reached out to them, Bites for Kids must now assess who is the most in need of help. Primarily, they will be focusing on those three inner-city Surrey schools. Each food kit they deliver is designed to contain four to six meals plus snacks. Campbell says that they try to include more foods that are high in protein, low in sodium, and low in sugar. They also try to make whole grains and produce available to students. For anyone who wants to support Bites for Kids, individual kits cost $20.00. Save On Foods has worked closely with Bites for Kids and has offered them a deal to purchase food at a better price. According to Campbell, this deal has been crucial to the group’s success so far, as they have been able to distribute much more food to children than they could have alone. Liv Interiors has also played a huge part in helping the team get started and is listed as a partner on their website. 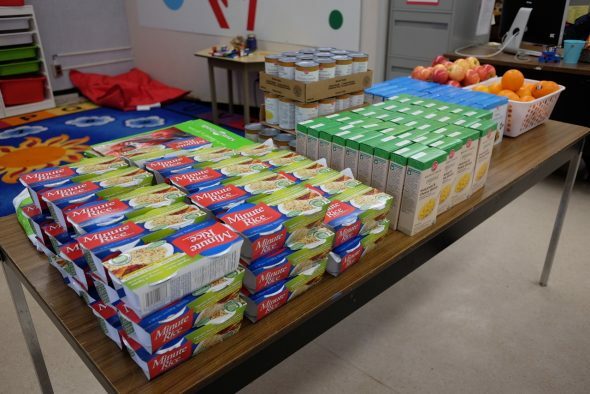 Campbell says that, because most people are currently preoccupied with the housing crisis and other social issues, the hunger crisis is being overlooked. Once Bites for Kids has enough support, they want to keep growing so that they can target the social issue on a larger scale.